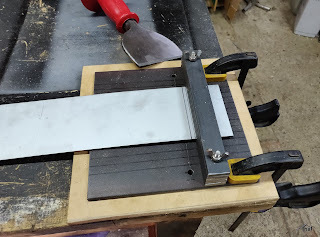 This project is a bit overkill for the immediate jobs I have planned but I enjoyed making this tool. 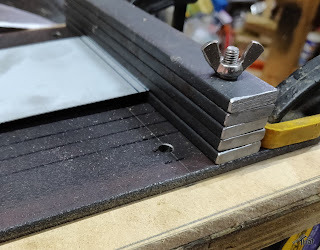 The reason for making a jig is that I plan to bend some sheet metal to make a more rigid bracket to hold the central door locking solenoid that I fitted last weekend. 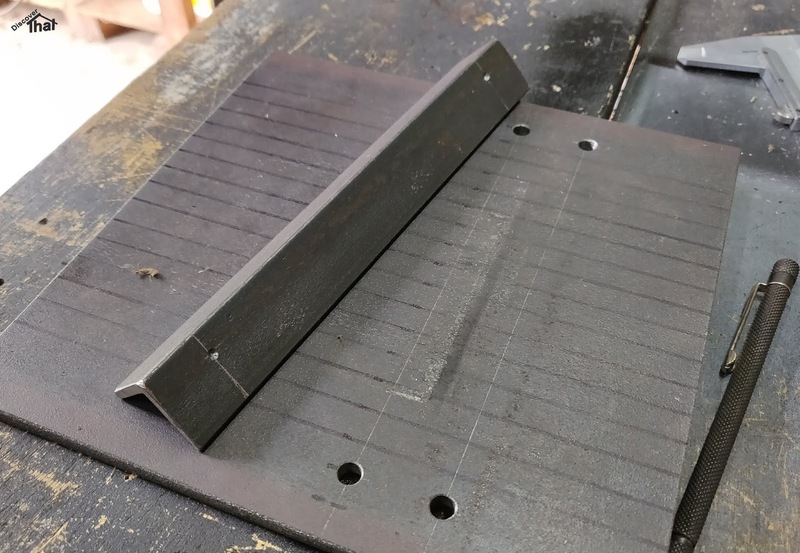 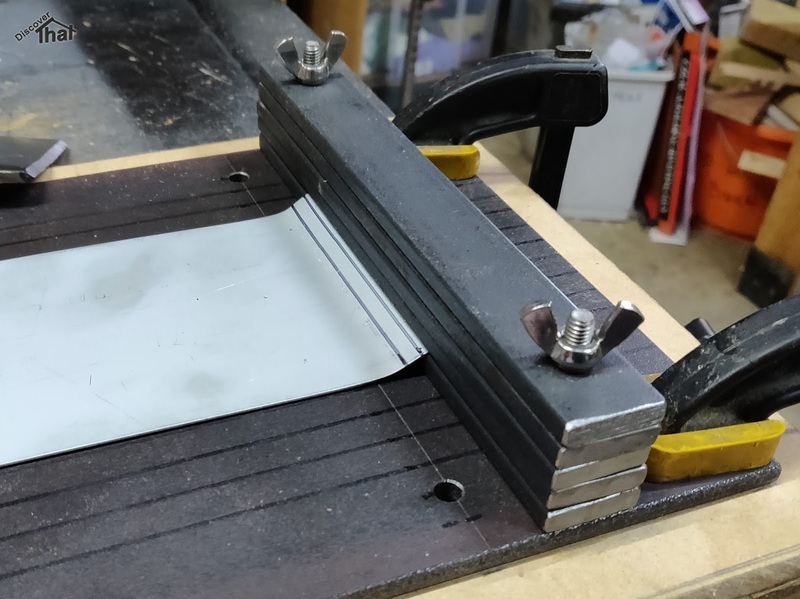 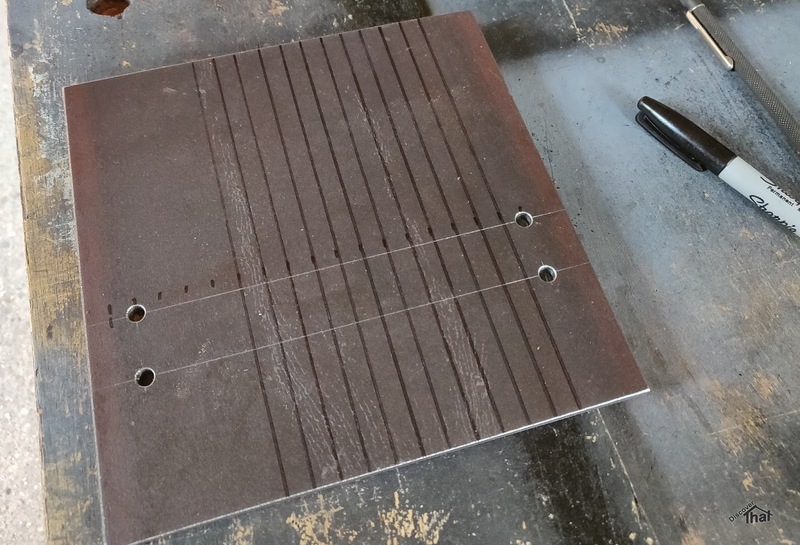 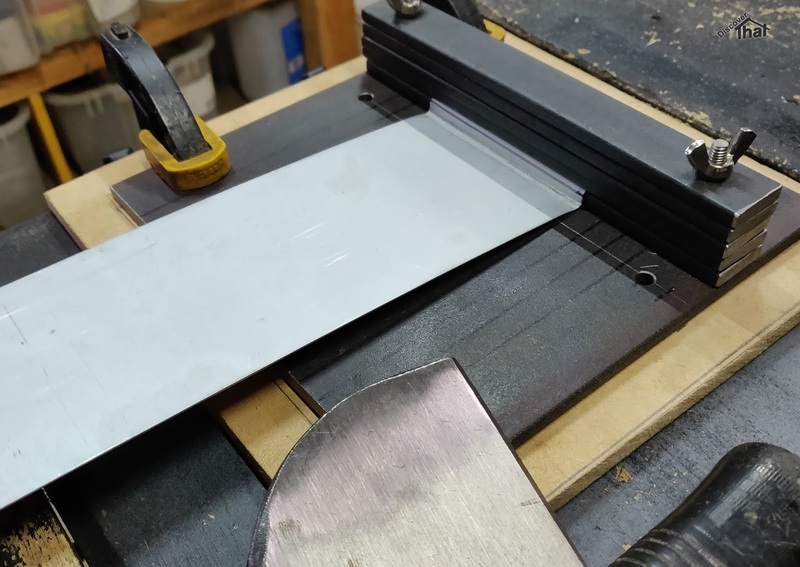 I need to bend a 5mm offset, a step looking a bit like a 'Z', in a strip of 1.2mm thick sheet steel about 70mm or 80mm wide. My bending brake cannot form an offset that short. 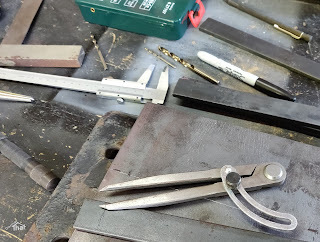 I might be able to do it in a vice or the edge of my bench but it's difficult to get a sharp edge on such a tight step. I looked at how the professionals would do it and a 'V' block came up plus some variations mostly used on presses. I have designed something that, I think, works like a manual 'V' block but that can be adjusted to form the offset bends I need. 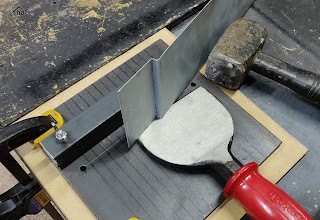 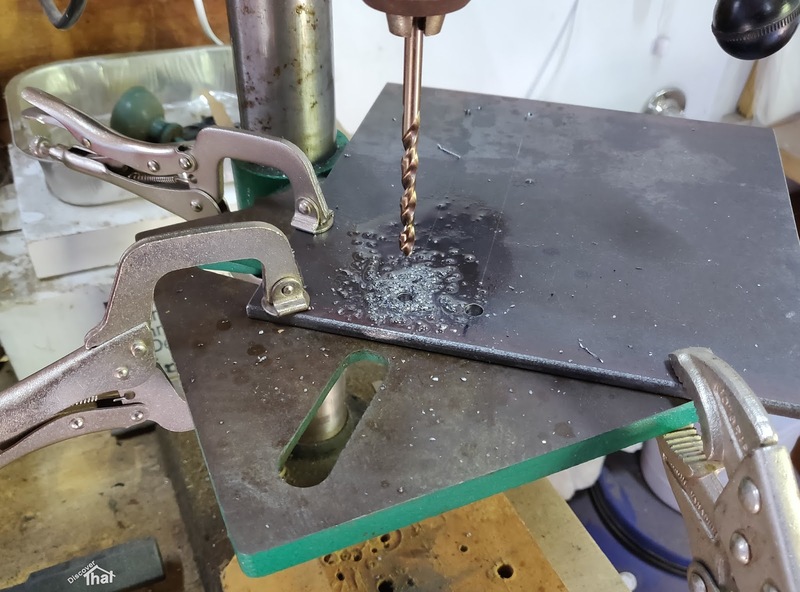 The idea is that I hit the metal with a large bolster and force it in to the corner of the jig. I used 5x lengths of 6mm thick mild steel bar 200mm long with a 6mm base 200mm square. 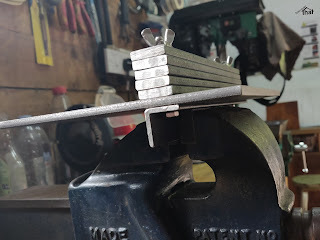 They are held together with M6 bolts, wing nuts and some spring washers. 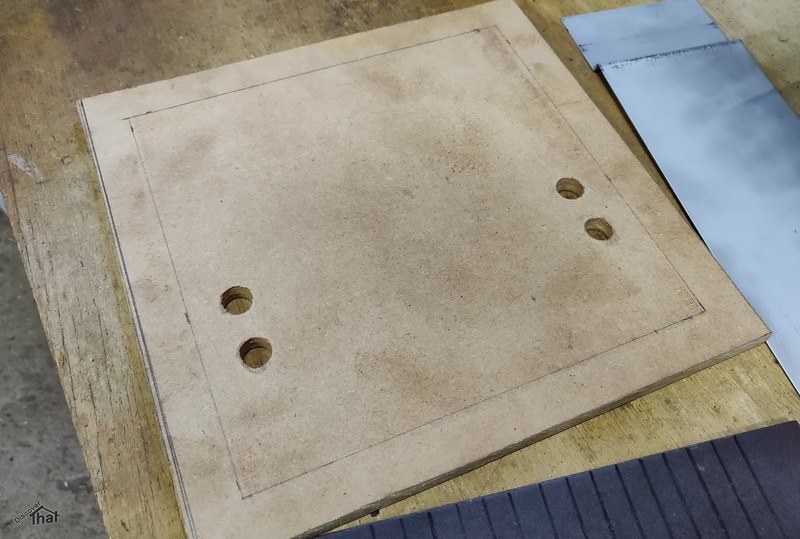 I've mounted it on a square of MDF with holes in where the bolt heads protrude so it sits flat on a work bench. 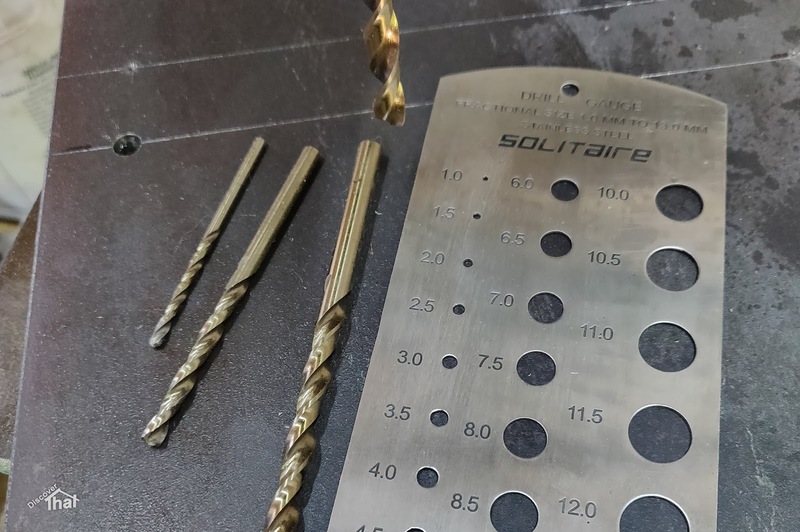 I have only just discovered cobalt drills. Probably because I don't do much metalwork, it has not mattered to me in the past but these drills go through mild steel almost like butter. 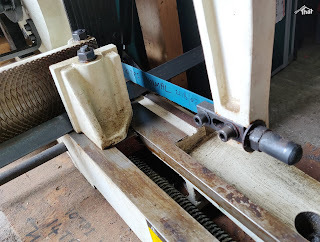 I also managed to tension the belts on my drill press so that did not stall as much as it used to. 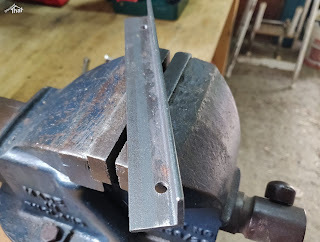 To get through the 6mm thickness, I drilled holes with increasing diameters, 2.5mm, 4mm, 5.5mm then finally 6.5mm to fit the M6 bolts. 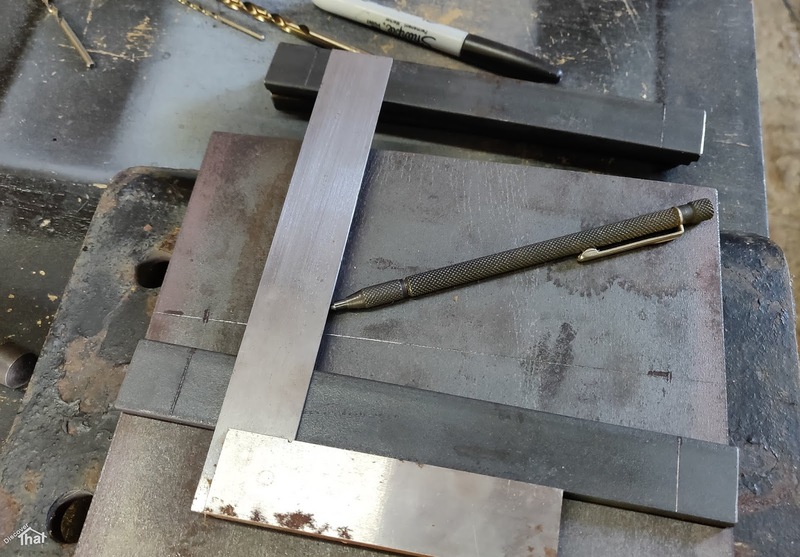 I added parallel lines to help align the work piece. 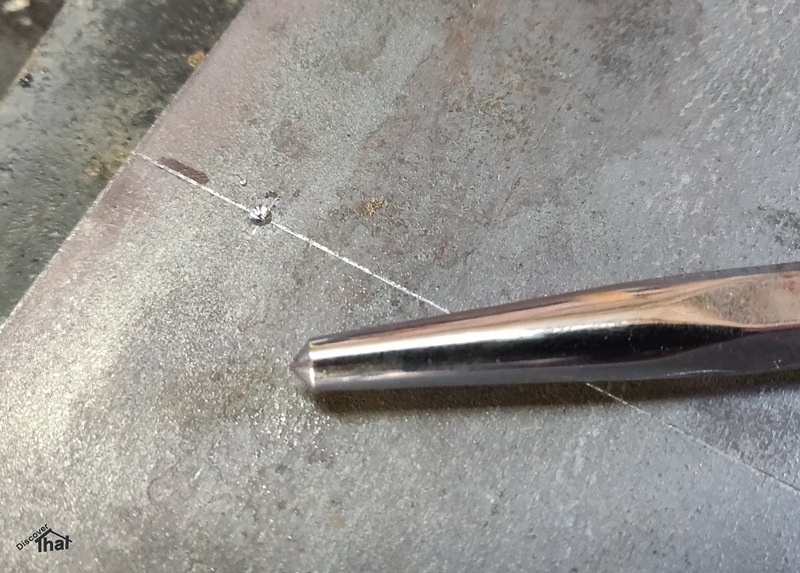 The end result should let me make any step that is a multiple of 6mm tall. 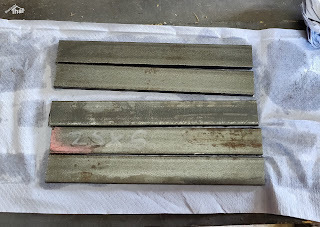 I could make some smaller spacers out of 1.2mm thick sheet and that would give me more options but for the jobs I have planned 6mm and 24mm will be perfect. 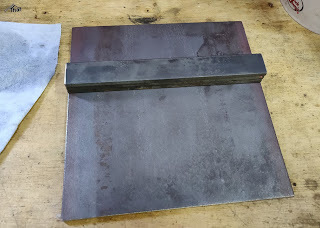 I carried out a test on some scrap sheet. I was able to get the profile I wanted fairly easily. 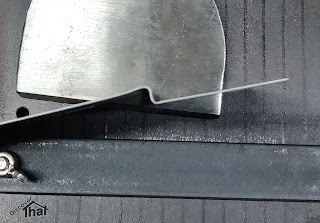 Bashing against the edge of the bench worked but was not ideal. 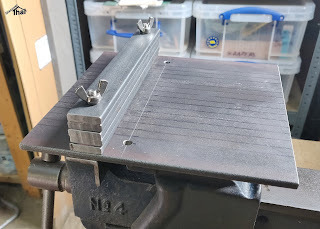 I've added an angle bracket to the back to be able to mount it in my vice. I deliberately positioned the holes so the bolt heads are flush up against the angle. 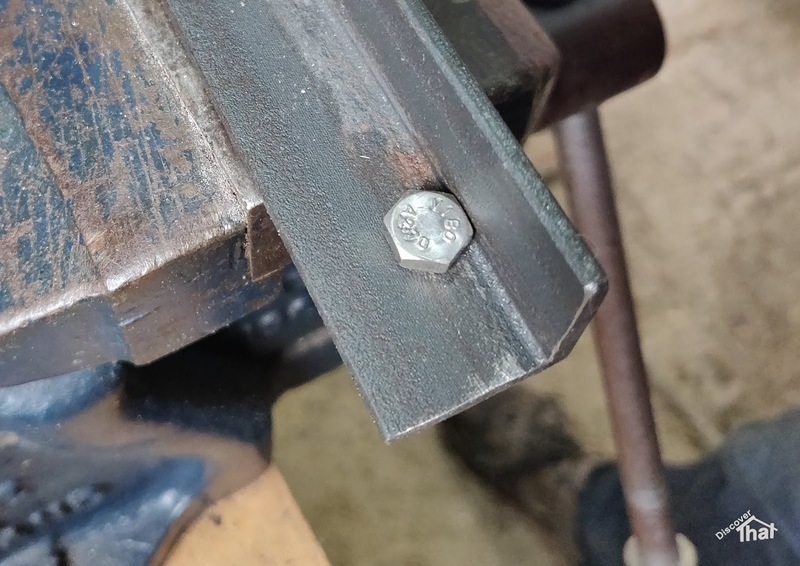 This means that no tools are required to tighten the bolts. 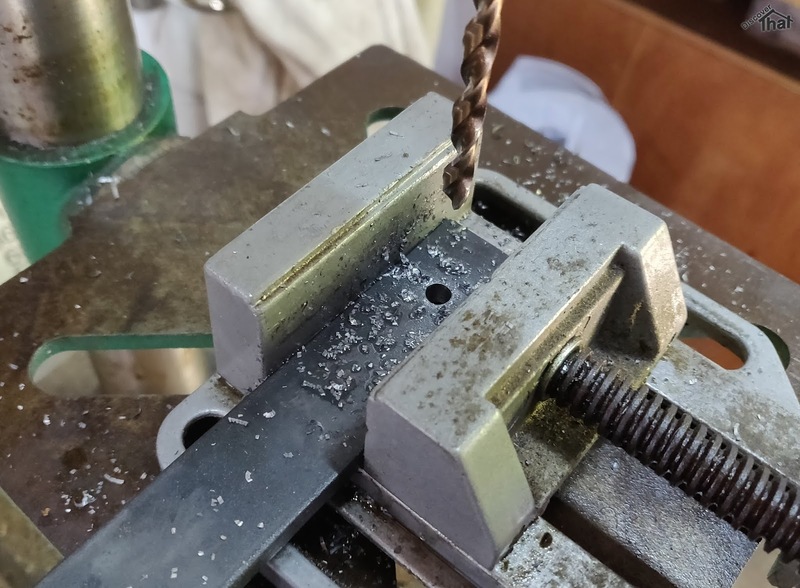 It feels much more comfortable and secure working in the vice.